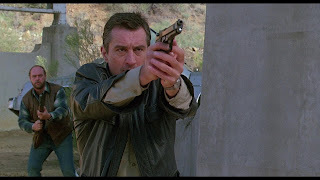 A buddy comedy road trip action film, Midnight Run collects mostly good things from its various genre components and assembles an enjoyable romp. In Los Angeles, ex-cop Jack Walsh (Robert De Niro) is a bounty hunter hired by bail bondsman Eddie Moscone (Joe Pantoliano) to find and retrieve mob accountant John "the Duke" Mardukas (Charles Grodin), who has gone into hiding. John stole $15 million from mobster Jimmy Serrano (Dennis Farina) and donated it to charity. In addition to mobster goons, John is also being chased by FBI Special Agent Alonzo Mosely (Yaphet Kotto) as well as Jack's rival, bounty hunter Marvin Dorfler (John Ashton). Jack has no trouble locating and capturing John in New York, but transferring him back to LA by the designated deadline proves troublesome. John has a fear of flying, which means the cross-country journey switches to trains, buses and cars, with the two bickering men constantly having to dodge Mosely, Marvin and Serrano's men. Along the way the high-strung Jack and the low-key John get to know each other, and eventually discover they have more in common than Jack cares to admit. Coming off the success of Beverly Hills Cop, director Martin Brest teams up with star Robert De Niro, looking for lighter fare after The Untouchables. The result is a bouncy opposites-attract cross-America journey, featuring an unlikely emerging friendship between two superficially polar-opposite men. The film never dawdles in any one place geographically or contextually, Brest hustling the action along and making excellent use of various locations and a cast deep in supporting talent. 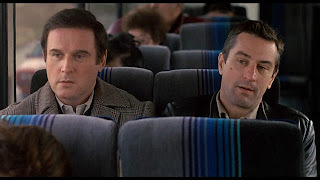 Midnight Run does go on much longer than it needs to. The film clocks in at 126 minutes, and there is no reason for what is essentially a lightweight comedy to drag on for more than two hours. 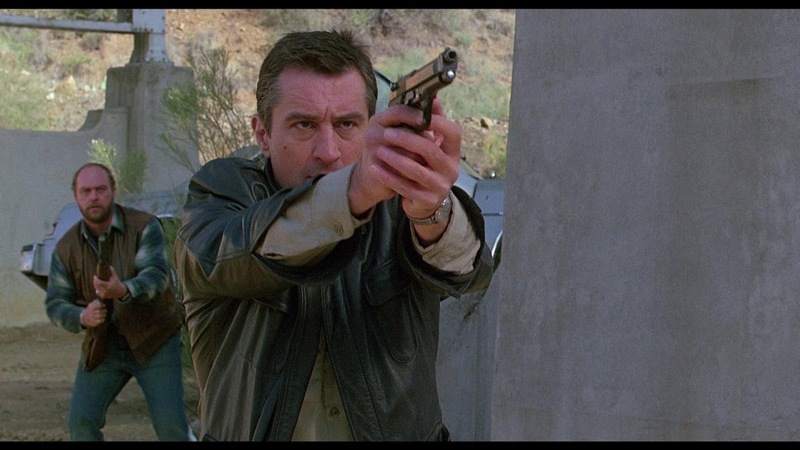 The George Gallo script runs out of the best ideas early on, and the second half of the film features plenty of regurgitation, both in the slowly evolving dynamic between Jack and John and in the repetitive action scenes. The FBI and Serrano's men botch several opportunities each to get their man, and after a while all the incidents of governmental and villainous incompetence start to meld together. But the film works most of the time, thanks in large part to the central relationship between accountant-criminal John Mardukas and jagged bounty hunter Jack Walsh. Charles Grodin as Mardukas is smooth, calm and the perfect foil for Robert De Niro's passive-aggressive but resourceful Walsh, and the strength of the script resides in the two men's journey from hostility to civility. The action scenes are more patchy in conception and execution, and feature the usual assortment of shootouts and chases with occasional helicopter interventions. The best comic lines come from the boorish Marvin Dorfler, a more dense and sloppy version of Walsh and not afraid to express his unfiltered thoughts in all their foul-mouthed glory. Midnight Run extends its sprint into a dogged marathon, but enjoys plenty of quality junctures along the way.